Curl up in comfort with the gorgeous, deep color and soft, supportive cushions of the Old English collection from Simon Li. This chair instantly boosts the sophistication and charm of any room you put it in, and its timeless style is made to last. The Old English Leather Chair with Irish Linen Tweed Pillow by Simon Li at Great American Home Store in the Memphis, TN, Southaven, MS area. Product availability may vary. Contact us for the most current availability on this product. 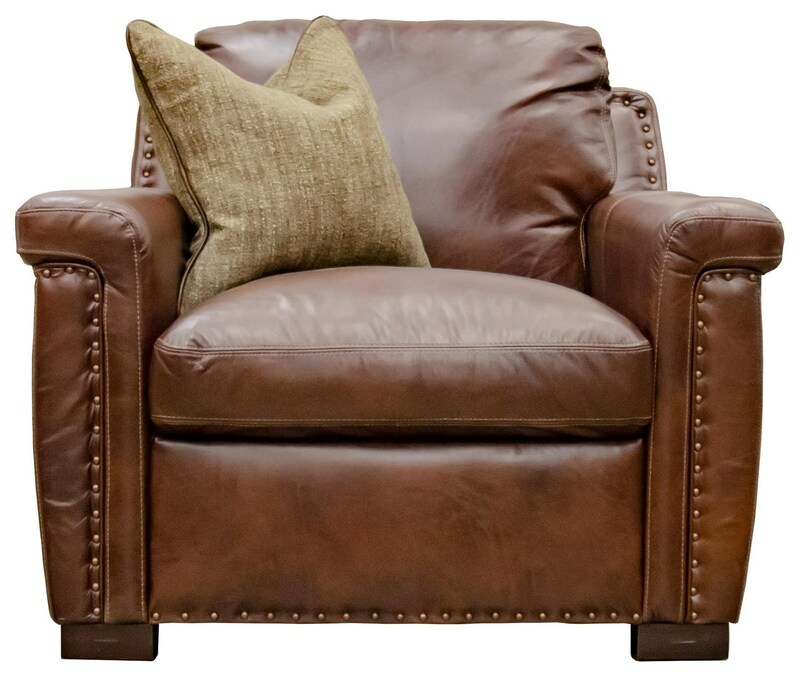 Fabric Content Top grain leather is used in all seating and areas you touch with a matching leather split or bonded leather on the balance of the item. Wood & Finish All legs are made of solid wood. Frame Construction Frames are constructed of furniture grade laminated and solid wood members, cut with precision by CNC equipment and fitted together similar to a jigsaw puzzle for added joint strength with corner blocks, glue and attachments in key joints. Seat Support The seat suspension has a webbing system woven into a basket weave pattern that acts like your personal hammock supporting you and not rolling into anyone sitting next to you. The backs also have webbing. Padding & Ergonomics Seat cores are made of 2.0 ILD high density polyurethane foam topped with a jacket of channeled blend down or if a pillow top seat, a fiber filled cushion is inserted onto the top pillow casing. Browse other items in the Old English collection from Great American Home Store in the Memphis, TN, Southaven, MS area.